MOSCOW, April 3. /TASS/. Head of the Russian Election Commission Ella Pamfilova handed Vladimir Putin a presidential certificate for a new six-year term in office at a meeting in the Kremlin on Tuesday. Pamfilova congratulated Putin on his landslide victory in the recent presidential race. 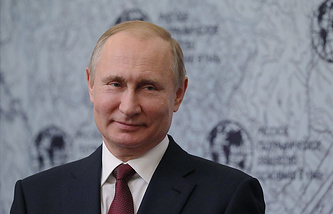 "Many have already said that probably this has been the most transparent and cleanest election in our country’s history," Putin stressed, thanking the election chief and members of all election committees for "the high level of organizing the work." The presidential certificate is a 100x70 mm dark red book with a firm leather cover, a photo and a double-headed eagle symbol. Russia’s presidential election was held on March 18. According to the final vote count, incumbent head of state Vladimir Putin won by a landslide garnering 76.69% of the vote. According to the Central Election Commission, the voter turnout was 67.5%. A record number of 56.43 million Russians backed Putin. Under the law, Putin is due to be re-inaugurated six years from May 7, 2012, the date when he last took office. The overwhelming majority of Russians - 88% - said the election results were trustworthy, opinion polls showed, according to Pamfilova.